Supplier & Manufacturer of Punching Press Machine. Our product range also comprises of Sealing and Cutting Machines, Plastic Film Extruders and Printing Machines. 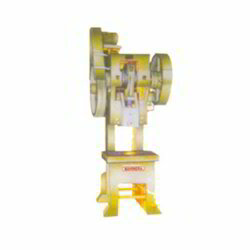 We are one of the leading manufacturers and exporters of high quality Punching Press Machine. This product is manufactured using optimum quality raw materials that are sourced from well known vendors. This product is highly appreciated for its working speed and low cost of maintenance. This product is stringently tested by our team of experts at each level of its production. We assure effective, flawless, and timely delivery of this product. Weight in Kgs. (Approx.) 200 Kgs. 250 Kgs. Looking for Punching Press Machine ?